I love discovering new books that I am excited to read to my fourth grade son, especially when they are a series. I love series! I get so attached to characters, and I want adventures to continue. Step inside Mr. Elives’ magic shop, where the shelves are stocked with strange and mysterious goods. The children in these five books each leave the shop with magical items intended especially for them. In The Monster’s Ring, Russell Crannaker, bullied all his life, gets a chance to fight back when he is given a monstrous magical item. In Jeremy Thatcher, Dragon Hatcher, a boy gets a small marbled dragon’s egg—and when it hatches, his wildest dreams take wing. 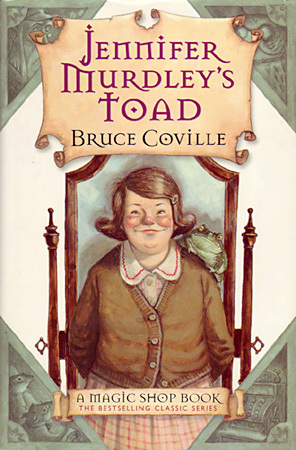 In Jennifer Murdley’s Toad, a girl “in a plain brown wrapper,” buys a talking toad who knows a thing or two about the true nature of beauty. In The Skull of Truth, Charlie Eggleston, the biggest liar in town, steals a skull from the shop, and it puts him under some sort of spell: He can only tell the truth—but now no one believes him! And in Juliet Dove, Queen of Love, a shy girl suddenly becomes the most popular girl in school when she wears the ancient amulet given to her at the magic shop. I have not read these books cover to cover, but flipping through them, I can tell we will enjoy them. Actually, they have attracted the attention of other parents that have visited our home and seen them on the counter. They just look so cool! These books are designed for children in grades fourth through seventh. Our 2014 Paper Procurement and Usage Policy, deemed industry-leading by the Rainforest Action Network, outlines HMH’s commitment to responsible and reduced environmental impact, including specific goals to achieve by 2018. Together with the Center for Green Schools at the U.S. Green Building Council (USGBC), HMH is working to provide more than two million children with access to safer, healthier, and better learning environments.